The Chasing Blood Demon, Sang Dong Ha. He was a member of the 15 guests, and was also the strongest member of the Dark Moon Guild. Right now, he was in a confused state. Sang Dong Ha sweated a bit when he heard Neng Ha Young’s calm reply. The Night Emperor? What was this nonsense? Didn’t the man go into hiding a long time ago? Neng Ha Young simply stared at Sang Dong Ha. Elder Sang Dong Ha couldn’t say anything. She was right. There was no reason for her to come here. And right now, that wasn’t the real problem here. Neng Ha Young didn’t answer the elder’s question. She simply smiled, and looked behind Sang Dong Ha. Elder Sang Dong Ha, when he saw the girl’s actions, felt a cold chill run down his spine. When he slowly looked behind himself, he could see an old man leaning on a table. A seemingly ordinary old man, who didn’t really exude any kind of aura. But the moment their eyes met, Elder Sang Dong Ha froze like a frog that encountered a snake. Elder Sang Dong Ha never allowed anyone to get behind his back, once he had become a harmonious expert. But there were always exceptions. Especially when it came to the old man in front of his eyes. Elder Sang Dong Ha stumbled backwards with a pale face. He soon realized just what he was doing, and and quickly greeted the old man. A completely white hair, combined with a pair of bored eyes. This was one of the three sovereigns in the martial world, the one known as the messenger of death, the Night Emperor Neng Mu Gi. Sang Dong Ha was looking at Neng Mu Gi with a timid face. He let out a suppressed moan, and ground his teeth. The old monster here didn’t change at all from the past. It was still strong. And that unique presence. That presence of the old man, which was being exuded out the body like mist, was pressuring Sang Dong Ha greatly. Sang Dong Ha carefully answered with an anxious face. When Sang Dong Ha made a confused face, Neng Mu Gi took a seat and spoke. When Elder Sang Dong Ha didn’t answer, Neng Mu Gi answered the question for him. How did he know? Especially when it was an information he acquired with great difficulty? Neng Mu Gi always made the right decision. Not once did the man make a wrong choice, and not once did the man lie. But not this time. There are many martial artists that became famous in the martial world. But there are few that gets remembered for a hundred years. And out of all those famous experts, there’s one that stands out the most: The Sword Devil, Ak Jung Pae. The ridiculous sword technique he showed the world. That technique was still known as the strongest sword technique to date. How could Sang Dong Ha give up on that? Even if that technique resided in the pits of hell, he would still jump down without a moment’s hesitation. It seemed that greed sometimes brought courage to people. If Neng Mu Gi told Sang Dong Ha this in the past, Sang Dong Ha would’ve given up immediately. But not now. Sang Dong Ha, whilst sweating profusely, never said that he would go back. Neng Mu Gi, after observing Sang Dong Ha’s attitude with a dull face, said something. Sang Dong Ha’s face brightened considerably. It seemed that Neng Mu Gi agreed with his decision. Neng Mu Gi looked at Sang Dong Ha with a calm face, and opened his mouth. Sang Dong Ha would’ve been careful of them, even without Neng Mu Gi’s warning. Even though the Black Moon Guild was quite big, their inner framework wasn’t set properly, unlike the one of the Heavenly Demon Church. Sang Dong Ha knew that well. Sang Dong Ha smiled faintly. It seemed that even an old monster turns tame after a long time. Neng Mu Gi’s warning only served to make Sang Dong Ha feel at ease. Sang Dong Ha, satisfied with Neng Mu Gi’s current self, quickly said his goodbyes. Neng Mu Gi didn’t respond. Sang Dong Ha knew that was Neng Mu Gi’s own way of giving permission to people. He quickly walked out the door. Neng Ha Young, who was staying quiet all this time, opened her mouth. Neng Mu Gi loosened his stiff face, and smiled a little. Neng Mu Gi spoke while pouring some tea to his cup. The Pope of the Heavenly Demon Church. Neng Ha Young’s eyes sparkled when he got ahold of this information. According to the official records, the three sovereigns never met each other face-to-face. All the ‘official’ records said that. This fact always managed to get on Neng Ha Young’s nerves. Forty years. That is not a short amount of time. Therefor, it was understandable for a person to become suspicious about it. Unless the three sovereigns all tried to steer clear away from each other, this feat was almost impossible. Neng Ha Young researched this subject out of curiosity. She soon reached a conclusion. Surprisingly enough, it seemed that the three sovereigns didn’t avoid each other. It’s just that since each of their territory was so different, they never really encountered each other. There was never a case where, in the history of the martial world, great martial artists with different alliances didn’t clash with each other. That alone made this case unprecedented. Neng Ha Young found this relationship of the three sovereigns quite amazing. That’s what made this so suspicious. The three sovereigns. Did none of them ever wonder about the strength of the other sovereigns? They were, in the end, human. Did they really never get curious about others? If any one of them moved in to meet the sovereign from a different party, the balance between the three powers would’ve been broken. That was because a meeting between two sovereigns had to develop into a conflict. That was where Neng Ha Young got stuck. Then, her grandfather, Neng Mu Gi, spoke. If they met each other before, one out of the original three would surely die. But that didn’t happen. That’s why Neng Ha Young couldn’t answer. Neng Mu Gi didn’t answer, and just smiled. He was admitting something. Neng Ha Young narrowed her eyes. She was getting curious. Neng Ha Young told her grandfather about the Martial World Sequence Records. Neng Mu Gi’s face turned serious when he heard about it. Just what about it was dangerous? While Neng Ha Young was trying to think of an answer, Neng Mu Gi sipped on his tea. And after thinking about something for a while, he began talking with a tone of hesitation, which was unusual for him. Neng Ha Young paused a bit. She had felt that she missed something huge from her grandfather’s response. What did she miss? When she carefully went over her grandfather’s words again, a thought struck her mind. At the same time, Neng Ha Young trembled. The Night Emperor, Neng Mu Gi. 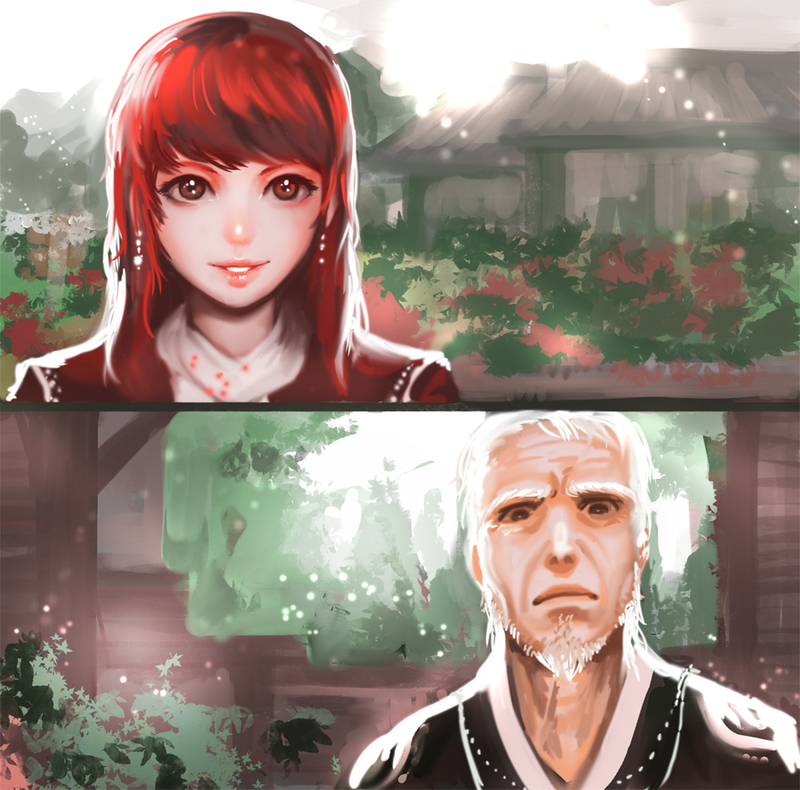 He looked at his granddaughter and smiled. The girl’s only flaw from the past was her own intelligence. She always managed to learn things better off not knowing. Because of that trait, Neng Mu Gi had no choice but to speak the truth. It was an unofficial meeting. And that meeting was the reason why Neng Mu Gi decided to go into hiding. After observing the man’s face, Neng Ha young carefully opened her mouth. Neng Mu Gi hesitated for a moment. He then spoke. Neng Ha Young nodded with a serious face. Surely, this ‘secret’ of grandpa’s was a ‘truth’ no one else in the martial world knew about. But that was why she wanted to know about it so badly. She knew that she could only survive in the martial world by relying on information. And that hidden truth actually had a very clear, distinct form, unlike what Neng Ha Young had suspected. I ill ask again here xD Someone can tell me what does “Shura” mean? Answered your question on chapter 24. If you wanted to create a chatroom you could consider just using IRC and andchat. In any case, thanks for the chapter. too…too many subtleties! I got the general gist, i suppose…! But it certainly suits the two of them, this grandfather and granddaughter pair, to speak without being particularly direct or clear…except for the mentioning of the Martial World Sequence Records…not that that’s a particularly big secret or anything…so, the sovereigns have met before, eh…? That would totally have been intense! Also, translator ensj, i would recommend Skype, more than LINE. I’d say Whatsapp, too…but for long-distance, i think Skype’s pretty good. I know translators who have a group on Skype too! And yeah, Neng Mu Gi’s story will appear soon enough, so you’ll have that to look forward to. Hm, Skype does that too! And, i guess you could use chatango too? Neng Mu Gi’s story appears soon? That’s cool! -waits excitedly- so many things i’m waiting for in this series! Yay! Thanks so much for all your hard work!!! I love this novel with unholy love!!! she, since this is Neng Mu Gi’s granddaughter. Therefor, it was understandable for a person to become suspicious about it.